• Anti-terror chief: "These vehicles are clearly linked"
LONDON, England (CNN) -- A vehicle containing fuel, gas canisters and nails found early Friday near Trafalgar Square is "clearly linked" to another explosives-packed car found outside a nightclub near Piccadilly Circus, Metropolitan Police said. A "considerable" amount of fuel and gas canisters, along with a "substantial quantity of nails," was found in the blue Mercedes 280E, said Peter Clarke, Metropolitan Police deputy assistant commissioner. He called the discovery of the second bomb "troubling," but urged the public to remain vigilant and report suspicious behavior to authorities. About 3:30 a.m., Clarke said, the Mercedes was taken to an impound lot in Hyde Park. Security sources earlier told CNN that workers who towed it thought the car smelled of gasoline, and became suspicious because of the reports that gasoline was among the explosive materials found in the first vehicle. Clarke said the second device, like the first, was "potentially viable" but was rendered safe by police explosives officers. "These vehicles are clearly linked," he said. The first car, a silver Mercedes-Benz sedan, was discovered about 1:30 a.m. when an ambulance crew called to treat an ill person noticed what appeared to be smoke inside the car and notified authorities, London police said. The car was parked in front of the Tiger Tiger club, and the discovery prompted the closing of several streets until the vehicle was hauled off nine hours later. "In the car, they found significant quantities of petrol together with a number of gas cylinders," Clarke said. He could not immediately say how much fuel was there. "I can tell you it was in several large containers," Clarke said. "There were also a large number of nails in the vehicle." He said explosives officers manually disabled "a potential means of detonation for the gas and the fuel in the vehicle," which preserved crucial forensic evidence for investigators. A cell phone was found as part of the device in the silver car, according to security sources with knowledge of the investigation, although it was not immediately known what role the cell phone may have played in the device. The sources said the device was apparently set up to be remotely detonated. Metropolitan Police Counterterrorism Command officers are reviewing closed-circuit security camera video to see if they can determine who parked the car there, Clarke said. Friday's incident came days ahead of the second anniversary of July 7, 2005, when four Islamic extremist suicide bombers killed 52 people on London's transport system in the deadliest strike on the city since World War II. Witness Daniel Weir said he was walking home from work when he noticed police had cordoned off the area around the nightclub and a nearby vehicle. Clarke said it was too early to determine if the smoke the ambulance crew saw was an indication that the car bomb had been activated but failed to explode. While Clarke would not speculate that Tiger Tiger was the target, he said "some features of what's happened resonate with previous plots." "In one previous case we heard talk about nightclubs potentially becoming targets. ... We, of course, saw reference to vehicles being filled with gas or fuel in order to create an explosion," he said. There had been no intelligence warning of an attack, he said. British Home Secretary Jacqui Smith said, "We're currently facing the most serious and sustained threat to our security from international terrorism." Brown, whose predecessor, Tony Blair, stoked anger among Islamic militants with his support for the Iraq war, said Britain faces "a serious and continuous threat" and the public "need to be alert" at all times. The incident also came days ahead of the second anniversary of July 7, 2005, when four Islamic extremist suicide bombers killed 52 people on London's transport system in the deadliest strike on the city since World War II. 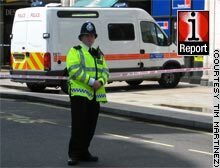 A police officer is on the scene Friday at Piccadilly Circus in London in a photo sent by student Tim Martinez. Does the London bomb terror alert make you think twice about visiting the city?